By Wednesday, I had already watched my favourite movie of the week twice. No, it’s not 8 1/2, but rather A Night at the Opera, the 1935 Marx brothers classic. 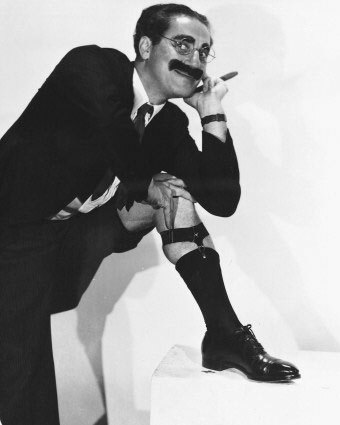 Groucho has some of the best one-liners I’ve ever heard in my life. I’d marry him if it weren’t for the fact that I’d get sick of wiping the grease paint off my face every time we kissed, not to mention the fact that he’s dead. I first read the back of milk cartons. But I mostly just looked at the pictures. It made the story easier to understand. Even at such a young age, I got it. The cows like eating daisies, they smile, while blinking their pop art eyelashes. They are happy to have their teats violated for me. I think from here I moved on to picture books, but those memories are all a little hazy. Must have been all the Children’s Tylenol I was jacked up on. I began to write in kindergarten. I had just learned a new skillset: the proper etiquette for eating paste. I was a sick kid (all the paste, of course) and spent about three weeks in hospital, during which I completed my opus. It was magnificent; something about a dinosaur. It glittered. I made a cover out of cardboard, which my mother had to sew together as the doctors had banned all paste.